The nine-banded armadillo is a cat-sized mammal that is covered with a scaled shell, or carapace, that protects it from predators. It ranges in color from brownish-black to grey, with yellowish white hair on its underside. The carapace is constructed of tough, leathery skin and dermal plates on its back, head, tail, and sides. The nine-banded armadillo has nine jointed bands across its midsection which allow for flexibility in movement. 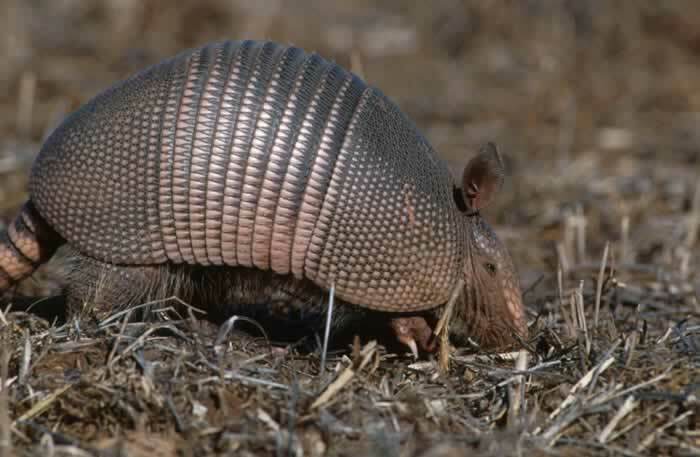 This armadillo ranges in size from 15-17 inches in length, with a ringed tail that measures between 14-16 inches long. The nine-banded armadillo has four toes on each of its front feet and five toes on each of its hind feet. It also has strong claws for digging and burrowing. 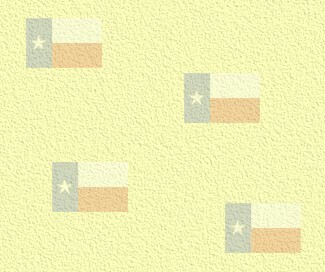 The armadillo has a small head with long ears and a pointed snout that it uses to forage for food. Armadillos build dens uderground to sleep in. They will often share their dens with other armadillos as well as with other animals, such as skunks, rabbits, and oppossums. Armadillos are not territorial. Armadillos are mostly nocturnal and use their specialized hearing and smell to make their way around after dark. Contrary to popular belief, the nine-banded armadillo cannot roll itself into a ball for protection. 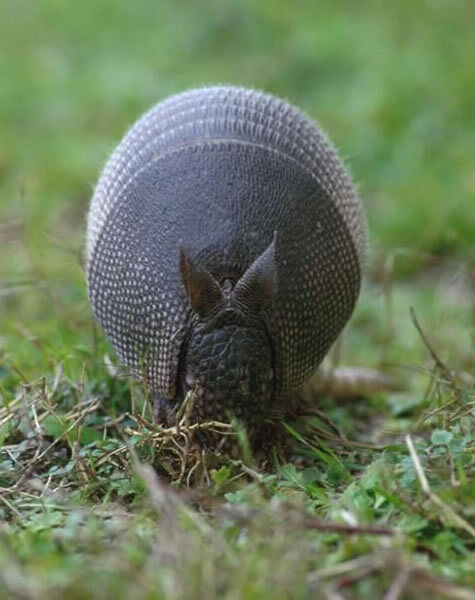 When chased by a predator into a burrow, the armadillo can wedge itself into the tunnel with its back to the outside. This makes it almost impossible to dislodge. When confronted by a stream or river crossing, the armadillo has two approaches. If the water is shallow, it will simply walk across the bottom. In order to cross deeper or wider waterways, the armadillo can swim across much like a dog. It is able to do this thanks to its ability to gulp air and inflate its digestive tract. Unfortunately, man is the armadillo's greatest predator. Armadillos are hunted for food in many areas of Mexico and parts of Texas, but are most often killed by cars in the United States. Typically female armadillos mate with only one male and they may even share a den during the mating season. Reproduction in the armadillo is characterized by a period of delayed implantation. The embryo does not implant until 14 weeks after fertilization has occurred. Approximately 4 months later, the female armadillo gives birth to four identical young who are born fully developed and with their eyes open. The young are able to walk within a few hours after birth and can begin to forage with their mother in just a few weeks. The skin of newborn armadillos is soft at birth, but hardens as they grow older. They continue to nurse for about two months and may stay with their mother for several months afterwards. Armadillos reach sexual maturity at about one year of age. The nine-banded armadillo resides in the Texas Wild Petting Corral at the Ft. Worth Zoo. The handlers bring him out during the afternoon, so he is readily available for observation and petting. Since armadillos tend to be nocturnal, this guy likes to sleep and take it easy during the day.